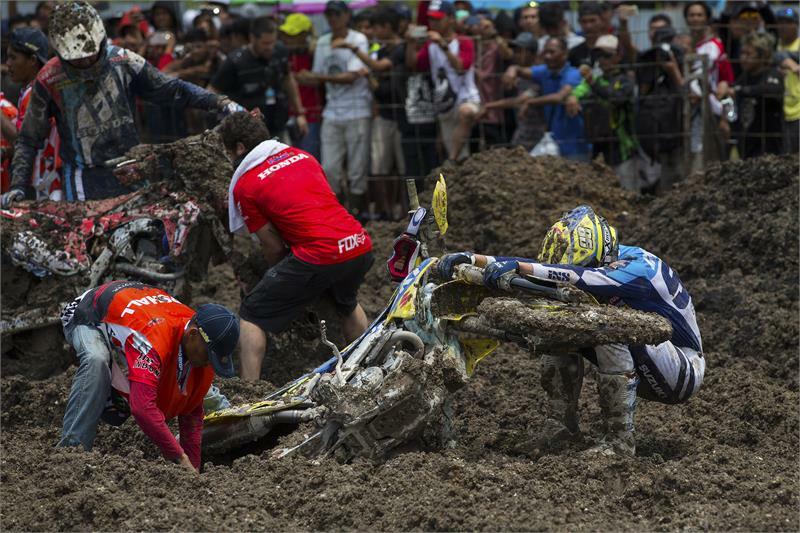 After two treacherously difficult motos in the deep mud of Indonesia, Suzuki World MX2 rider Jeremy Seewer came out victorious for his first ever overall result today aboard his RM-Z250. It rounded-off a great day for the Swiss rider because he was also able to win his first ever race in the first moto with a clever approach that minimised any mistakes and kept himself on two wheels while everyone around him crashed. While he may not have been the fastest, he was definitely the smartest and in such horrible conditions, this was by far the better option as the record books will now show him as the 2017 MXGP of Indonesia MX2 winner. There was also good news in race two as Seewer got the holeshot, closely followed by fellow Suzuki rider Hunter Lawrence; who came from the middle of the gate to sweep into second place round the first corner. Unfortunately, the young Australian’s day wouldn’t go exactly to plan in terms of results, but at certain times of the race, he was easily the fastest rider out on the track.